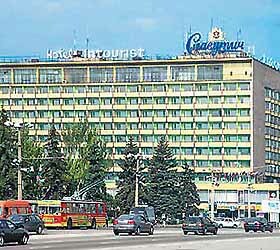 "Intourist Hotel" is centrally located in Zhaporizhzhya, and is easily accessible from any part of the city. It offers guests everything required for enjoyable rest and productive work - 230 modern guestrooms with minibars, air conditioning, Sat-TV, and Internet access (Wi-Fi), parking in the inner yard and in front of the hotel, 24-hour room-service, ticket offices, and guided tours. The hotel accommodates restaurants of European, Ukrainian and Japanese cuisines with themed interior design. The Lobby Bar and the Summer Terrace offer a wide choice of drinks and coffee. Mr.Churchill Lounge & Bar and stylish Crowbar Club offer entertaining show-programs. Staff at the hotel's conference centre serves seminars, presentations, conferences and business meetings of any type and scale, and services banquettes and receptions. The hotel's four conference rooms have the capacity to accommodate up to 300, 150, 40 and 20 delegates, and come fitted with cutting-edge technologies. On top of that, Intourist Hotel provides - hairdressing services, sauna and massage room, laundry & dry-cleaning services, car rentals (via hotel's partners), ticketing, travel agency, translation services.